Vehicle manufacturers and component suppliers are becoming uncomfortably familiar with the need to recall their products to fix ‘safety defects’ – and the negative publicity that such recalls can attract. 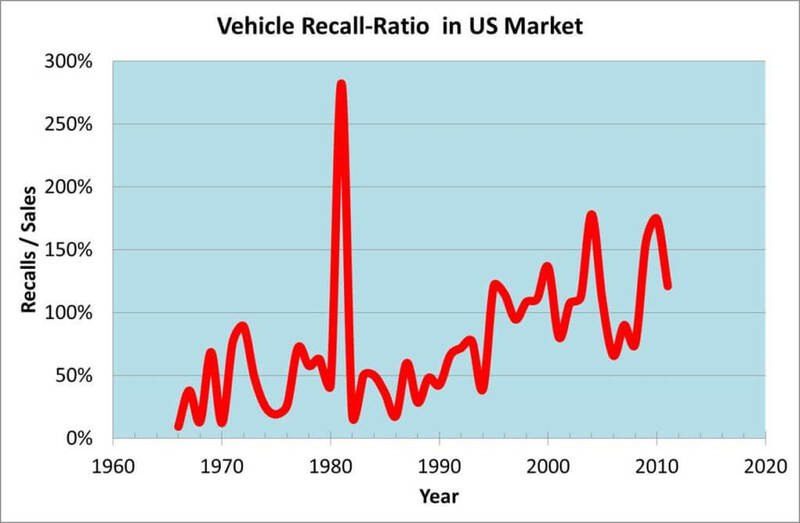 In fact, data supplied by NHTSA – the US regulator for vehicle safety – shows that a ‘typical vehicle’ sold in the US will need to be recalled more than once to correct safety defects – and the situation has been getting progressively worse since the 1990’s. Although some recent recalls have been the result of ‘complex technology gone wrong’ – and some are fundamental design problems – many are the result of simple process errors in the supply chain and production process. Under the US TREAD ACT manufacturers and component suppliers are required to notify the US regulator, NHTSA, promptly when they discover the need for a product recall – and there are severe penalties if you conceal defects from the public. NHTSA also regards ‘public education’ as a core activity, and actively encourages members of the public to report any concerns that they may have via their website – and engages with the public through Facebook and Twitter to raise awareness of product defects and current recalls. Information about consumer Complaints, NHTSA Investigations and Product Recalls is freely available on the NHTSA website and can be searched by make and model or model year – or you can download and analyse the the NHTSA database if you want! Advanced Product Quality Planning (APQP) to to co-ordinate the the efforts of the development team ensuring that requirements are captured and satisfied by the product and process design. To learn more about Product Liability and how you can prevent product recalls why not contact Phil Stunell now?